In his book 'Trout Madness' John D. Voelker, aka Robert Traver wrote a short story entitled 'The Fish Car.' It was a 1928 model that he named 'Buckshot' which he used for hunting and fishing across Michigan's Upper Peninsula. If you have not read the story I will not spoil it for you, but suffice it to say it was a compelling tale. 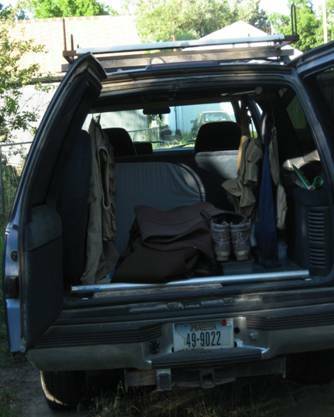 I have had a couple such vehicles during my tenure as an angler/hunter/outdoor nut. In my earlier years the family car served the purpose, much to the displeasure of the other half of my family. When I moved to Montana in 1974 I remedied that situation by purchasing my first hunting/fishing vehicle, a 1961 Willy's Jeep station wagon. With a flat head six cylinder engine and manual locking hubs it would go anywhere that it was possible to take a vehicle. Equipped with a roof rack for my canoe or john boat, a rifle rack for my hunting rifle and shotgun, and a set of chains for all four wheels I was equipped for just about any circumstance. When I started guiding it served as my guide vehicle, hauling gear and clients all over Montana. It never failed to start, took me wherever I wanted to go, and when I sold it in the early 90's it had over 100,000 miles on the odometer. 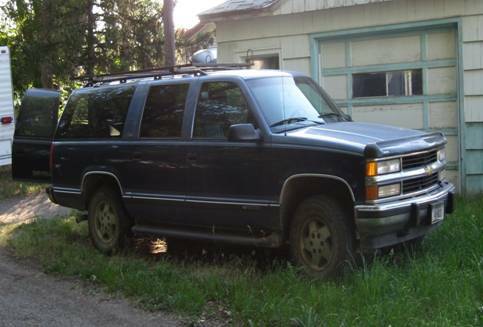 After I sold that old Jeep I reverted to using the family vehicle for a few years until one day I chanced upon my present vehicle, a 1994 Chevrolet Suburban. For many years my older brother owned a Chevy Suburban, and I always longed to own one so when I found this used model on a local car lot I had to have it. With just 74,000 original miles on the odometer, and a price that said 'buy me' I drove off the lot the proud owner of a new outdoor recreational vehicle. Suburbans are BIG, and today they are not all that popular. On a good day this old girl gets 15 mph with a tail wind. She has a 40 gallon tank, and at today's gas prices you need to take out a loan to fill her up. When I hitch up the camping trailer the mileage drops down to 10 or 12 mph depending on the terrain, but she does hold the gear and she will go just about anywhere a vehicle can go. She rides like a Cadillac, and handles like a tank. Looking from the back with the two doors open you can see just some of the things that I normally carry. Waders, rods, vests, [note that everything is plural]. There is a pump to blow up belly boats, flat tires, etc. Two plastic storage bins setting on the rear bench seat have blankets, a down jacket, road atlas, topographic maps, candles, and toiletry items. There is a gear bag with several different reels, extra tippet spools, and assorted other fly fishing gear. There is a pair of oars for my pontoon boat under the seat, bear spray for pesky grizzly bears, and sometimes a rifle or shotgun. There is rack for holding full assembled rods inside, and on the roof there is a custom built rack for holding belly boats, pontoon boats and canoes. When fully loaded I am fully equipped for just about any type of fishing or hunting sport. Over the last 12 or so years I have taken many trips with this old Suburban, and more than once I have been glad that I had it. A few years ago my late wife and I were coming home from a camping trip when the car in front of me decided to make a turn into a side road without signaling. At 55 mph there was little time to stop, and with the trailer pushing us it was either hit him in the rear or put her in the ditch. I chose the ditch and as we peeled off the road she held her ground and we pulled back onto the roadway, shaken but upright. It dumped the contents of all our cupboards in the trailer, but we survived without a scratch. Today high gas prices are making it more and more difficult to justify driving a big old dinosaur like my recreational vehicle, and it will be a sad day when I have to park her for the last time. Until then we will continue to make the rounds of streams, lakes and backcountry roads. Unless I have forgotten to put it in, you can bet that I will have the necessary gear to take advantage of whatever adventure that I encounter.